The result of combining various powerful concepts is a system that has much of the strength and power that already has been developed together with something that really works for all the issues that need addressing in the modern world. We have technology that is amazing, but we are not using available technology in ways that will deliver the best outcomes for humanity. The 'state' of anything is essentially a balance sheet. It is the sum of the good things and the sum of the bad things at a point in time. 'Progress' is the improvement in the balance sheet from one point in time to another. It is the good things getting bigger and/or the bad things getting smaller. 'Performance' is the relationship between the amount of 'progress' in a period, and the resources used to achieve this progress. Note that performance in one entity is most often offset by a negative performance in another entity. A major issue with capitalism as practiced in recent decades has been that the economic performance of business organizations has gone up while the impact on society and the impact on planet (resource depletion and environmental degradation) has gone down. CAPITAL is a key idea in the management of the socio-enviro-economic system. Capital is rather like STATE. It is essentially an inventory of everything in the system at a point in time. Financial Capital is only a part of ALL the capital. There is also capital associated with people and society, and there is capital associated with nature in all its manifestations. There is also capital that has been created by the efforts of people, whether it is physical capital like buildings and equipment, infrastructure, etc or intangible capital like knowledge, culture, government, etc or financial capital or financial wealth. When the accounting is done for ALL capitals, then some increase and others diminish. A sustainable system is one where none of the capitals are being degraded. During the period since the 1970s there has been a substantial increase in financial capital, but the human and social capital has increased less and natural capital has been substantially degraded. This cannot continue. The idea of incremental continuous improvement is very powerful, but missing in much of the management of society. In the field of international development, most initiatives are 'project' based and rarely of durable value. On the other hand, initiatives that enable people to improve their quality of life bit by bit over a lifetime produce sustainable results. Cost and management accounting is at the center of every good management information system. Good management information is low cost, timely and helps decision makers at all levels understand the behavior oc costs so that better decisions can be made. Many systems collect, record and store massive amounts of data, but good systems go a step further to help the user understand what the data means. One of the ways in which cost accounting has been modified to help improve understanding has been the development of standard cost accounting. With this approach, decision makers are helped to focus on variances from standard performance, and then eliminate issues that are producing unfavorable variance and replicate what it is that is producing favorable variances. Conventional accounting is all about money transactions and in this context there are costs and there are prices. Costs become cost of sales and prices become revenues, and the difference becomes profit. In most conversations about issues in the economy, cost and price seem to be interchangable. In fact it is cost plus profit that equals price AND what is price to the seller is cost to the buyer. Conventional accounting does not address the matter of value, but value relative to price is the key driving force of economic activity. MDIA goes beyond the accounting for money cost to account for both money cost and impacts (positive and negative) of inputs to business, and goes beyond money price to account for both the money price and the impacts (positive and negative) that are the value. There are facts about everything, but only a few of these facts get turned into data that may be used in the analysis of state, progress and performance in the enviro-socio-economic system. There must be data to represent all (as close as possible) of the facts. These data must be architected so that they may be summarized in a useful way, and these data should be used to provide feedback so that better decisions can be made on a timely basis. Double entry is the core concept that has made conventional accounting so powerful and so reliable for hundreds of years. The system of double entry enables a clear distinction between balance sheet accounts and profit and loss (or transaction) accounts. This enables easy reporting of both the 'state' of the business entity (Balance Sheet) and the 'flow' of the business (Profit and Loss Account). Because of the double entry construct, the 'profit (or loss)' or 'surplus (or deficit)' for the period may be determined in either of two ways. The result for a period is shown in the profit and loss account as the difference between the costs and revenues (debits and credits). The period result is computed using the balance sheet accounts as the difference between the balance sheet at the beginning of the period and the balance sheet at the end of the period. Conventional financial accounting based on double entry gives a clear distinction between balance sheet and profit and loss accounts. This enables easy reporting of both the 'state' of the business entity (Balance Sheet) and the 'flow' of the business (Profit and Loss Account). The 'profit (or loss)' or 'surplus (or deficit)' for the period may be determined in two ways. It is shown in the profit and loss account as the difference between the costs and revenues (debits and credits) and it is also shown in the balance sheet as the difference between the balance sheet at the beginning of the period and the balance sheet at the end of the period. Effective feedback is absolutely vital for a stable system. Engineering appreciates the importance of feedback, economics less so. It is also important to understand that fast feedback is very much more powerful than feedback that takes a long time to happen. Most feedback in the modern economy is too slow and rarely specific enough to be of much use. The dataflows in the MDIA framework are designed to be timely and actionable by all decision makers in the system. There has been explosive growth in the quantity of data and massive increase in the speed that data flows ... but only a very small part of the dataflow is used for useful purposes. It is vital, therefore to have dataflow that serves to support the essential feedback needed to manage performance and make better decisions. In academic circles there is a need to 'publish' so as not to perish and academic dataflows tend to support this goal, but in management there is a need to achieve better performance and for that the dataflow need to be supportive of better decision making in every part of the system. Where the assumption about profits is that they are more and more likely not to be achieved in the future and accordingly the discounting reduces the number ascribed to future profits as they go further into the future, in the case of extreme weather events they are almost certainly going to get more and more costly into the future and the same sort of discounting should not be used. Rather, the net present costing from future extreme weather events should be augmented not discouted. PROCESS is the key NODE that describes an ACTIVITY. Most PRODUCTS flow through a series of PROCESSES before they are purchased by an end-user for use. This string of PROCESSES is often referred to as the SUPPLY CHAIN. The SUPPLY CHAIN is optimized mainly to improve the profit performance of the various ORGANIZATIONS that operate thevarious PROCESSES in the chain. The TVA system of metrics applies double entry constructs in a way that means that a TVA PROFILE of a PRODUCT shows not only price and cost at a single stage of the supply chain, but also includes the totallity of the accumulated impact from the beginning of the supply chain to the present stage. PRODUCTS move through the system and are used to maintain and improve quality of life. Most PRODUCTS flow through a series of PROCESSES before they are purchased by an end-user for use. As the PRODUCT moves through the SUPPLY CHAIN there is an accumulation of money costs impacts on both people (society) and the environment. IMPORTANT: Note that performance in one entity is most often offset by a negative performance in another entity. A major issue with capitalism as practiced in recent decades has been that the economic performance of business organizations as measured in financial capital / money has gone up while the impact on society and the impact on planet (resource depletion and environmental degradation) has gone down. In conventional accountancy it is relatively easy to quantify everything because the main elements of contracts and individual transactions are usually denominated in money terms. Costs are usually all about money and prices that relate to revenues are also measured in money terms. Social value and environmental value are more difficult to quantify because they are significantly more complex. Scientists use quantified measures in their work, but this is rarely easy to understand for broader use by a non-expert general public. But without quantification, social value issues essentially are treated as being valueless, as are environmental issues. This is obviously wrong ... but it is exactly what happens when appropriate measures are missing. One of the core concepts in conventional financial accounting is to have clarity about the reporting envelope and the reporting entity. Everything within the reporting envelope 'cancels out' while transactions that cross the reporting envelope are included in the accounting for external reporting. Impacts that are 'outside' the reporting envelope are considered to be 'externalities' and not reported in conventional financial reports. Shadow Pricing is a widely used work-around in conventional financial accounting analysis in order to understand the impact on financial performance of a business environment where prices are different. Most well managed corporate organizations use 'standard costs' to help manage their operations, and it is very powerful. In True Value Accounting, standard value profiles work in a similar way to enable better decisions to be made without an excessive amount of data overload. Cost accounting is an important dimension of management accounting, but very easy for there to be too much data and not enough useful information. Instead of trying to establish 'actual costs' in detail for every item, a 'standard cost' can be calculated for each item. The appropriateness of the standard cost can be checked against the totals of the department or organization over a period of time. If the standard is incorrect, investigation can be made to correct the standard or to correct the operations. This is a very powerful way to manage for improved performance. Everyone is familiar with money as a unit of account. Money serves two purposes: (1) as a medium of exchange for the transaction; and (2) as a store of value. Money and double entry accounting was a very powerful system for accountability when the economy was relatively small and impact on society and the environment was ignored without much consequence. But the 21st century is different. The population of the world is at record levels, and the degradation of the environment in many different ways has become consequential. There is a need now for UNITS OF ACCOUNT that are relevent for all the impacts associated with economic transactions. Business transactions are quantified in relation to money, and there is a complete infrastructure (payment systems, accounting) that enables money transactions and also the storage of money so that its value may be used at a future time (banking). 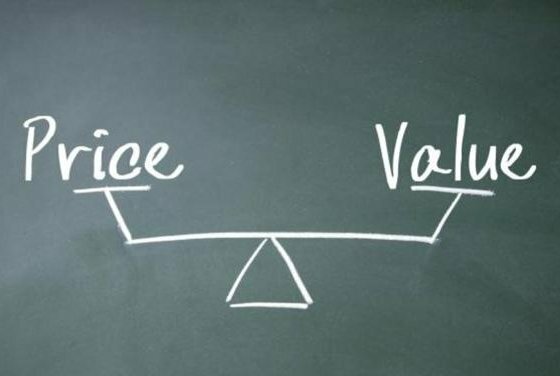 Value and impact are not quantified except in some cases where it is assumed (often wrongly) that a market price and a value are the same. Economics tells us that price is determined by supply and demand, and therefore changes as supply or demand changes. Costs behave in a different way, partly as result of changes in the prices of purchased inputs, and partly according the the engineering and technology of the processes. Value also has variability depending on the situation, but this has rarely been quantified. The MDIA initiative does this by using standard values in the same way that standard costs have been used in the business environment. Standard costs may be determined by engineering analysis, and standard values may be determined by a similar analysis of all the factors involved. The current version (2017) of True Value Impact Accounting has emerged after many iterations of development. In 1975, more than 40 years ago Peter Burgess realized that conventional corporate financial accounting was not good enough to use as a source of data for decisions about development. Over the years many other issues with economic and financial measurement were identified including the idea that what was good for profit was good for the society. One of the core ideas was that place really mattered and that we should focus more development analysis on the performance of place rather than on the performance of projects. Around 2005 the idea of Multi Dimension Impact Accounting (MDIA) emerged, a system for the measurement and reporting of impact on all the capitals band the modern complex world, The system tht emerged was designed to measure everything that really matters, embracing the powerful concepts of double entry accounting and applies them not only to money transactions but to everything important not transacted in money. KEY PERFORMANCE INDICATORS for the TRIPLE BOTTOM LINE and more. A very weak way of trying to oversee the progress and performance of programs and projects for development assistance and humanitarian aid and widely used by organizations like the World Bank, the United Nations and bilateral aid agencies like USAID. Something much better is needed starting off with better basic accounting and management information. 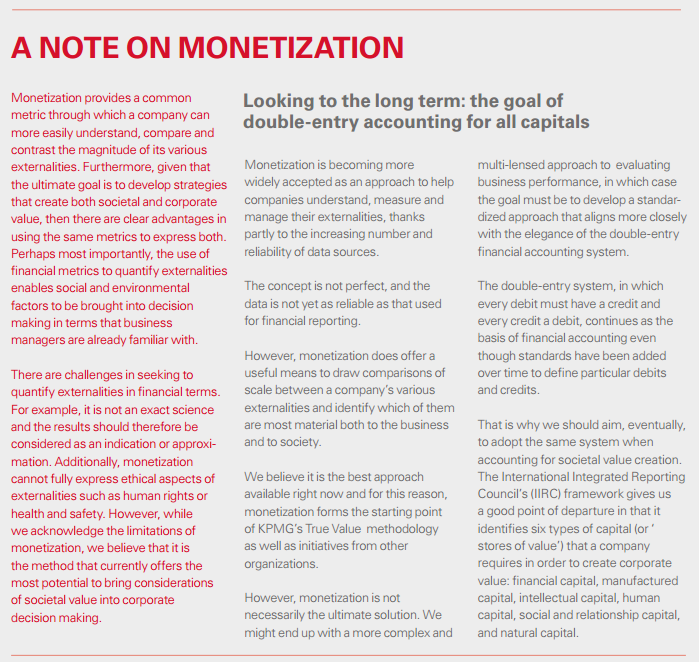 'Monetization provides a common metric through which a company can more easily understand, compare and contrast the magnitude of its various externalities. Furthermore, given that the ultimate goal is to develop strategies that create both societal and corporate value, then there are clear advantages in using the same metrics to express both. Perhaps most importantly, the use of financial metrics to quantify externalities enables social and environmental factors to be brought into decision making in terms that business managers are already familiar with. There are challenges in seeking to quantify externalities in financial terms. For example, it is not an exact science and the results should therefore be considered as an indication or approximation. Additionally, monetization cannot fully express ethical aspects of externalities such as human rights or health and safety. However, while we acknowledge the limitations of monetization, we believe that it is the method that currently offers the most potential to bring considerations of societal value into corporate decision making. Monetization is becoming more widely accepted as an approach to help companies understand, measure and manage their externalities, thanks partly to the increasing number and reliability of data sources. The concept is not perfect, and the data is not yet as reliable as that used for financial reporting. However, monetization does offer a useful means to draw comparisons of scale between a company’s various externalities and identify which of them are most material both to the business and to society. We believe it is the best approach available right now and for this reason, monetization forms the starting point of KPMG’s True Value methodology as well as initiatives from other organizations. However, monetization is not necessarily the ultimate solution. We might end up with a more complex and multi-lensed approach to evaluating business performance, in which case the goal must be to develop a standardized approach that aligns more closely with the elegance of the double-entry financial accounting system. The double-entry system, in which every debit must have a credit and every credit a debit, continues as the basis of financial accounting even though standards have been added over time to define particular debits and credits. TPB Note: There are many problems with using money as the measure of impact on capital starting with the idea that money itself is a dysfunctional metric. The TVIA approach has similarities except that there are multiple units of measure as well as multiple capitals. The approach has a lot in common with multiple currency accountancy. In multiple currency reporing, the results change depending on the exchange rates that have to be used. There are several core concepts in science, engineering and accountancy that have been embedded into the design of True Value Impact Accounting. The Double Entry construct is one of the most important. This idea ensures that there is a rigorous connection between the change in STATE and the associated activities or FLOWS. This idea mirrors some of the basic thinking in engineering thermodynamics and science. The accountancy profession enagaged in assurance in large part to ensure that reported performance reflected the facts and the related data about the facts. This remains important as the proligeration of data makes validation of the data and the associated analysis and reporting more and more critical ... and perhaps even moreso as AI and Big Data become more widely deployed.